“It’s showing people you care, that’s what it’s all about,” said Russell Haynes, Mechanical Supervisor of Virginia Paving Company in Norfolk, Va. Along with its parent company, Lane Construction, Virginia Paving is heavily involved in community fundraising efforts at all seven of their locations. Although this M2 106 dump attends autism fundraising events, it is a working truck. Every day it is on the road, hauling asphalt out to jobs and material in from quarries. Virginia Paving does a lot of interstate projects, city schedule work, and other large projects including the Oceana Naval Air Station runway in Virginia Beach and the Dominion Boulevard Steel Bridge in Chesapeake, Va. All of their trucks are equipped with the SmartPlex electrical system, which allows the addition of safety interlocks to help prevent injuries and equipment damage. 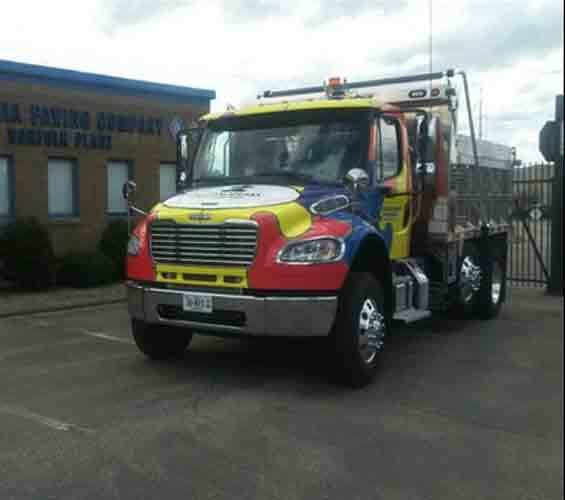 In line with the company’s culture of keeping it in the community, the M2 106 Autism Speaks dump truck was wrapped by Eure Signs in Virginia Beach. The Autism Speaks dump truck in front of Virginia Paving Company.